Butter beans are so soft and creamy – this is one of my favourite recipes for them – I often serve this instead of mashed potatoes. This is one of my storecupboard recipes as I use tinned butter beans to make this. Of course you can use dried beans, soaking and cooking them in your usual way. Butter for frying the onions. 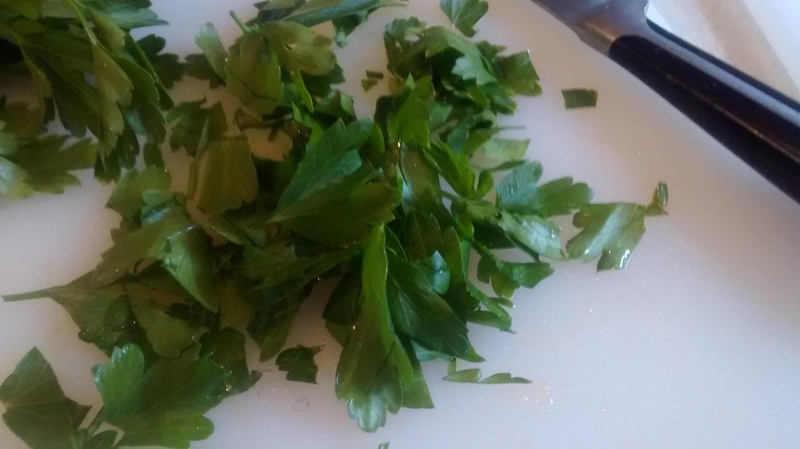 Chopped chives or flat-leaved parsley to serve. A deep, large frying pan is good for making this. 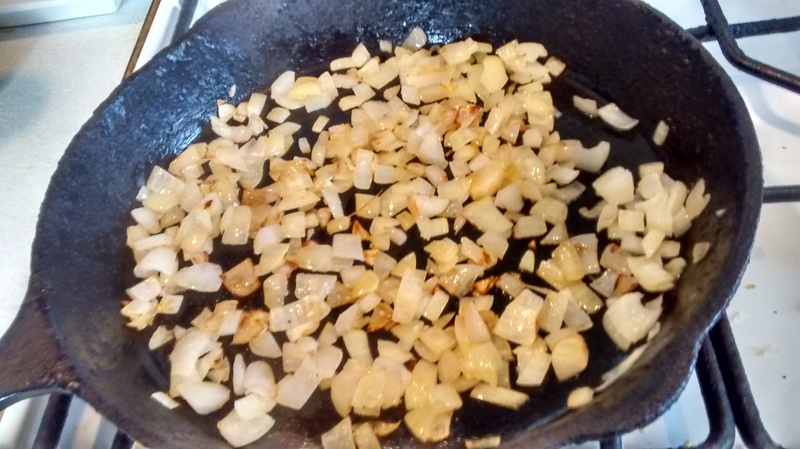 Chop the onion into small squares and fry gently in butter until they are soft and golden brown. Chop the garlic and add this to the onions, stirr and heat for a minute. Drain the beans from the tins and add these to the onions. Cover with stock and simmer gently until the beans are soft. Use a potato masher to mash the beans and onions. Cook for a few minutes longer – cooking away an excess liquid. You can put this into an oven proof dish into a low oven at this stage whilst you finish off the rest of the meal. Garnish with chives or flat-leaved parsley to serve. Serve instead of potatoes with meats or other cooked vegetable dishes. 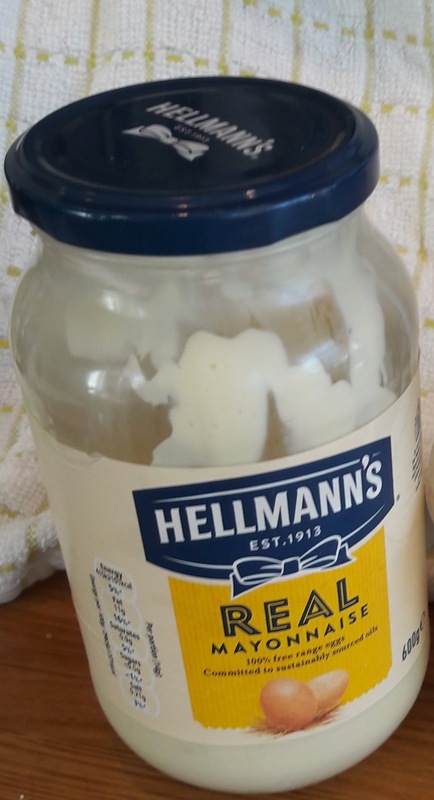 Having tried out this new honey dressing with a potato salad, I thought I would use it with white beans – the result was super! Mix all the ingredients except the dill in a jug or bowl with a little whisk. Handfull of chopped dill to serve. Mix all the salad ingredients together,except for the dill, in a bowl. The salad is best made several hours before serving to let the dressing infuse into the beans. I often leave it overnight. Add the extra dill just before serving. 1 red pepper – cut into strips and then across – to give rough squares. Mix all the salad ingredients together, except for the dill, in a bowl. either tipping the beans into a saucepan, adding some water and heating them up for several minutes, then leaving them to go cold. or pricking through the skins with a cocktail stick or similar. I believe this recipe is very popular in America and I think it is a sort of second generation recipe which is made up from memories of dishes from Poland and some adaptations using local ingredients. I feel this is a blend of two previous bean recipes Beans – po Staropolsku (in an old Polish style) which has a lot of sweetness using prunes and honey and Breton beans with tomato sauce. Here the sweetness is from maple syrup (I still had some from my friend who now lives in Canada – so thought of her as when making this). 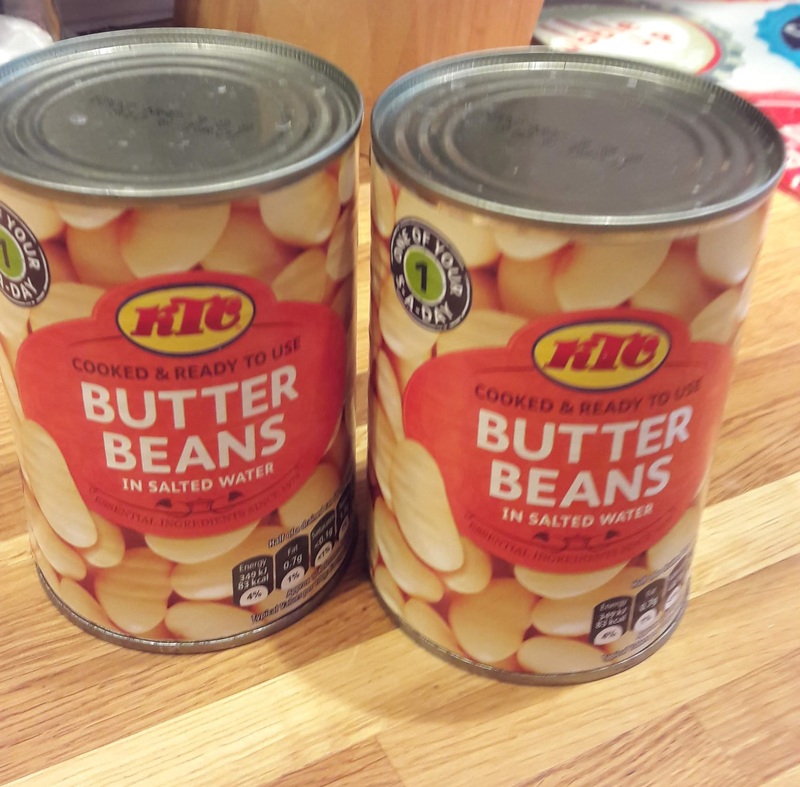 4 large tins of different beans (butter beans, canellini, haricot, red kidney etc) – some recipes say that using some butter beans is a must! Drain the beans and place then into an ovenproof dish with a lid. Chop the onions into small pieces and fry them up in a little oil. 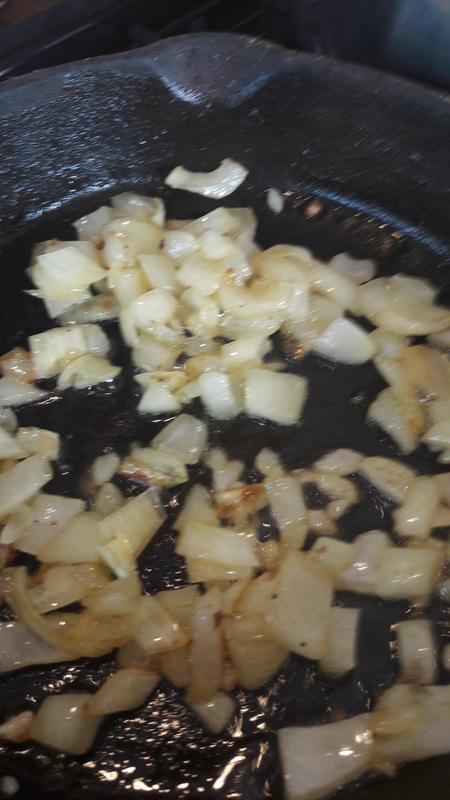 Chop the bacon into small pieces and add these to the onions and fry them together. Slice and chop the sausage and add this to the onions and bacon. Add the minced meat to the mixture and fry this up for a few minutes. Add this mixture to the beans in the dish. Mix in the tomato puree, mustard, vinegar, maple syrup and black pepper. Put the lid on the dish. Cook for around 3 hours in the oven until the beans are soft. Po staropolsku means in an old Polish style and this often includes using prunes and honey. Originally this recipe would have been made with dried beans soaked overnight. To make life easier I usually use tinned beans such as haricot, cannellini (white kidney beans) or black-eyed beans. Haricot beans in Polish are called fasola jaś which means Johnny bean. In the British TV comedy programme Mr Bean, which is very popular in Poland, our hero is called Jaś Fasola. Put the prunes in a dish and cover them with boiling water and leave for around 15 minutes. Remove the prunes (save the liquor) and chop them into into quarters. Chop the bacon into small squares and fry these up in a little sunflower oil. Chop the onions into small pieces and add them to the bacon and fry them all up together. Lightly brown the flour and add the liquor from the prunes and any more water needed to make a pourable sauce. Add the fried bacon and onions, honey, ground pepper and marjoram. Drain the beans from the cans and put them into an oven proof dish (one that has a lid). Add the bacon mixture to the beans and mix together. Put the lid on the dish and cook in the oven for at least 1 hour, I often cook this for a lot longer as I like the beans quite soft but take care that I top up the liquid if necessary. 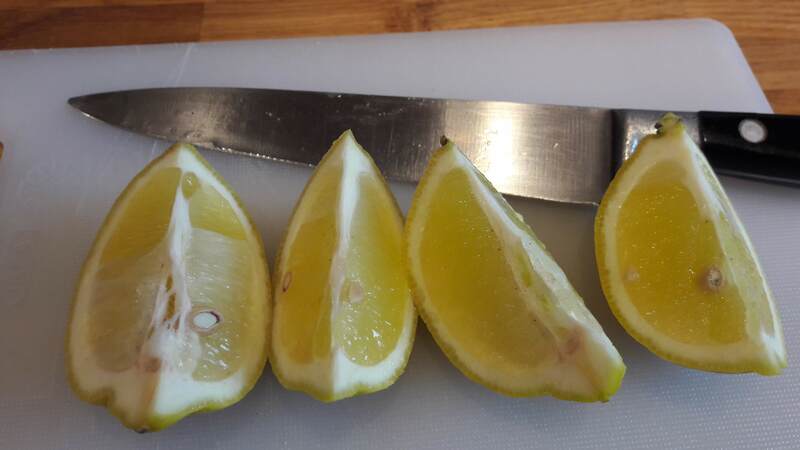 Serve each portion with 1 or 2 quarters of lemon – the squeezed juice adds a little zest to beans. The Polish for these is kotlety z fasoli – cutlets from beans. The word kotlety(plural) comes from the Italian word cotoletta(singular) for cutlet or chop. Phaseolus vulgaris, common bean, originated from Central and South America, where it was cultivated as early as 6,000 BC in Peru and 5,000 in Mexico. it was introduced to the Old World by the Spanish and the Portuguese. It is a legume which means it is a plant that has its seeds contained in a shell or pod. Most of the recipes in my books use dried beans and they are prepared by soaking them overnight and then boiling them for the required amount of time. For ease I usually use tinned beans. You can use haricot beans (wash off the sauce from baked beans), cannellini (white kidney) beans, butter beans and many others. Chop the onion into small pieces and gently fry in butter. Rinse and drain the beans from the tins. Pat the beans dry with kitchen roll or a clean tea towel. Mash the beans until you have a thick smooth paste. Add the onions and the mixed herbs. Add the potato flour to make the mixture thick. Cover a plate or board with dried breadcrumbs. Make flattened balls from the mixture – coating them on all sides with breadcrumbs. Fry the fritters in hot sunflower oil. They can be kept warm in the oven whilst you cook them in batches. They can be reheated in the oven at GM5 – 190°C – for around 15 minutes. This is a variation on the above recipe – to the mixture as above you add – 2 chopped peppers & 1-2 medium chillies or 2-3 small chillies, which have all been softened by gently frying in some butter and then added to the onion mixture. You can also add some chilli flakes. Both versions of these fritters go well with a crisp salad, salsa or a sauce such as tomato or mushroom. They also go well with meat dishes in a sauce such as gulasz, pulpety or chicken casserole.